On November 10th, a group of artists gathered at the Hammer Museum for a previously scheduled meeting of the Hammer Artist Council. The agenda was summarily scrapped to deal with the more urgent situation at hand following the election of Donald Trump. What can we do? Are we truly facing a fascist administration? How can we protect the vulnerable and defend rights we have come to take for granted? How can our actions have a direct impact to effect the political change we want to make? What emerged from this meeting was a call to effective political action. We invite the greater Los Angeles art community to join us in constructing a network to respond to the increasingly alarming executive actions, policy proposals, and the culture of fear, hatred, and exclusion. We seek to construct a network for artists to share information, coordinate responses with established organizations, and leverage our cultural capital to effect meaningful change in our communities, at the state level, and nationally. 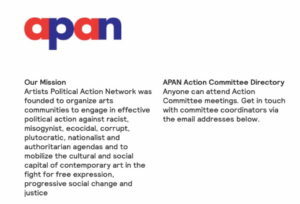 Through the network, we will create issue-based working groups, and provide all members with avenues for potential action at critical moments. We recognize that many of us are already marching, gathering, organizing, boycotting, and protesting on social media. We want to build upon this energy, and be a part of a larger, sustainable movement. We want to make a space for artists to come together, in person, to share our pain and outrage, and use our creative energy to resist this administration by all means necessary. This is an opportunity to affirm that art is not neutral, and to reject institutional entanglements, redirecting the potentials of art towards constructive action. Please join us in solidarity. at 356 S Mission Rd.